Larger picture shows location of otosclerosis, note the difference in bone coloring. The smaller inset photo orients with basic ear anatomy. 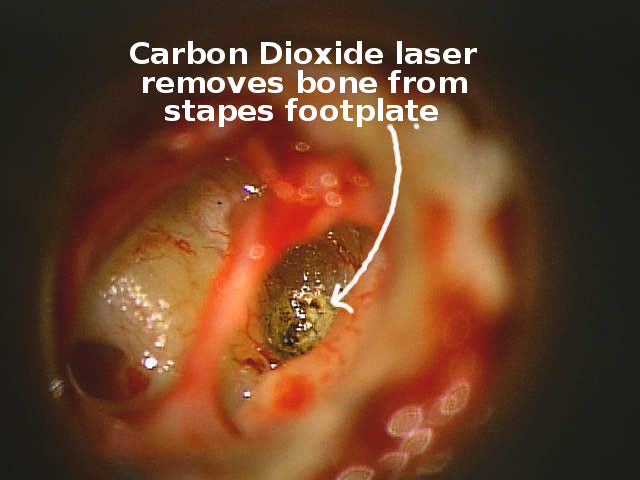 A CO2 Laser is used to weaken small areas of the bone so that the stapes arch comes apart from the incus and stapes footplate with less trauma. 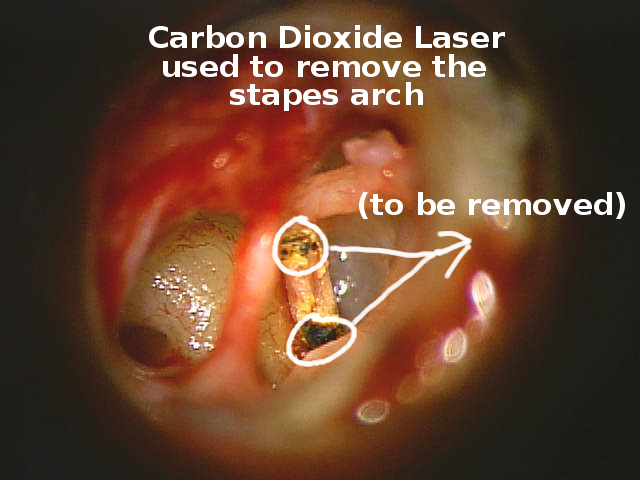 A CO2 Laser is used to weaken a focal spot in the stapes footplate so that the inner ear can be opened with less trauma. The hole into the inner ear (stapedotomy) through the stapes footplate is ready for the soft tissue layer and prosthesis. Here is the soft tissue (aerolar fascia from post auricular muscle) layer in place. This picture illustrates the small size of a stapes prosthesis. The stapes prothesis is now in place. After laying the ear drum membrane and ear canal skin back in place it seals with blood. Antibiotic cream protects the ear canal from infection. Otosclerosis may cause hearing loss in children and adults with an incidence of about 8 per 100,000 population per year. In otosclerosis, abnormal bone grows around the footplate of the stapes. The abnormal bone growth dampens the vibrations of the stapes bone, causing a hearing loss. The hearing loss type is called conductive because it affects the mechanism that conducts sound from the ear drum membrane to the inner ear. Sometimes, otosclerosis may also damage the sensory hair cells in the inner ear, causing sensorineural hearing loss. Sensorineural loss occurs in about 20-30% of patients that have otosclerosis. 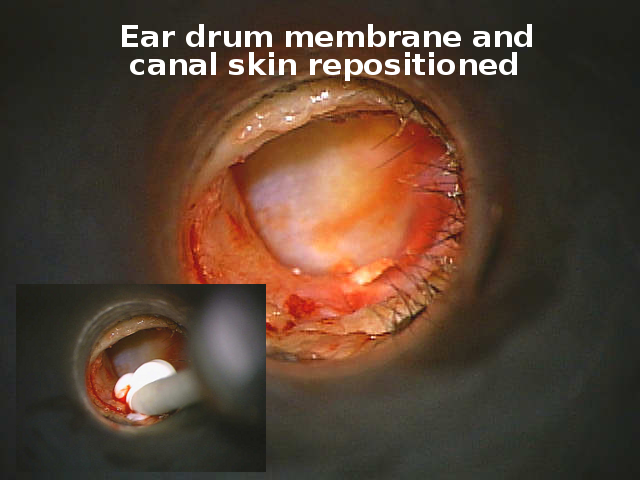 Sensorineural hearing loss may develop years after a successful operation that satisfactorily repairs hearing conductive mechanism. The sensorineural loss may be mild or severe. Even when sensorineural hearing loss is present, surgery may improve the conductive hearing loss sufficiently to allow more effective use of a hearing aid. Otosclerosis seems to be an inherited problem that is triggered by a viral illness, perhaps the measles virus. While otosclerosis tends to run in families, most blood relatives are free of the disorder. Some research has shown that Caucasion middle-aged women are at most risk. Asians and people from the Indian subcontinent are more prone to develop the disease, as well. Pregnancy related hormone changes worsen pre-existing otosclerosis. Some other causes of stapes bone fixation may be corrected at least in part with surgery, such as osteogenesis imperfecta. Most individuals with otosclerosis notice a gradual hearing loss. Both ears are involved in about 70% of affected persons. Low-pitched sounds are impaired first. The high frequency sounds are usually worsened next, while the middle range frequencies are the last to be affected. Other symptoms may include dizziness, vertigo, or other balance problems and/or tinnitus (noise in the ear). An otolaryngologist working with an audiologist provides a combination of history, physical examination, and hearing tests that make the diagnosis. A complete audiology examination includes an audiogram with speech testing, and a tympanogram (middle ear flexibility and pressure test). An audiogram measures a person’s hearing sensitivity. A tympanogram measures how well the middle ear conducts sound. Commonly, the physician also uses tuning forks to compare hearing through the bone behind the ear with hearing through the ear canal. Otosclerosis is one of several diseases where lower frequency tuning forks are heard more loudly through the bone behind the ear than through the ear canal. These results, along with the physician’s exam, allow the physician to make a diagnosis of otosclerosis with a high degree of certainty. Alternatives in management of hearing loss caused by otosclerosis may include observation, use of a hearing aid, and/or surgery. A hearing aid can improve hearing by amplifying the sound. The audiologist works with the person to select among hearing aid alternatives. Most choose surgery to improve hearing. Three surgical procedures can be done for otosclerosis: stapedectomy, partial stapedectomy, or stapedotomy. The surgeon generally decides which to perform based on experience and findings at surgery. In stapedectomy, the surgeon removes the entire fixed stapes and replaces it with a prosthetic device that will allow sound waves to be passed on to theinner ear. A partial stapedectomy usually removes the arch of the stapes bone and a portion of the stapes bottom plate. 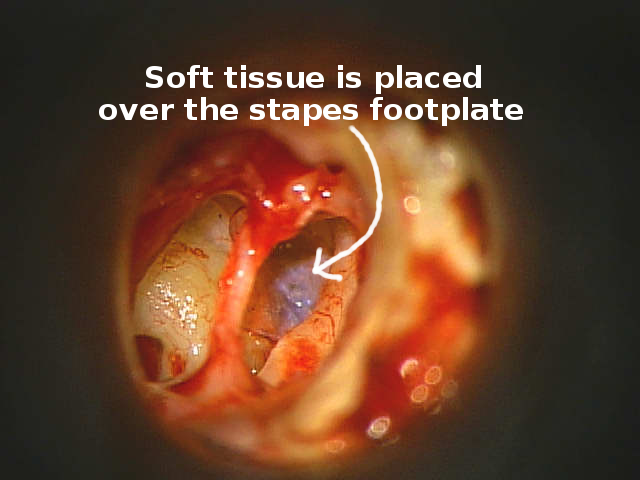 Stapedotomy removes the stirrup-like arch and places a tiny hole in the bottom plate of the stapes. In all three approaches, the surgeon replaces the stapes bone with a prosthesis attached to the remaining footplate of the stapes and to the incus (anvil bone). The prosthesis transmits sound waves on to the inner ear. All three surgeries are done through the ear canal under high power magnification with a surgical microscope. General anesthesia allows the person to sleep during the procedure, which takes generally less than an hour. After surgery, about an hour in the recovery room is followed by two to four hours in the ambulatory outpatient surgery area. With a KTP laser (potassium titanyl phosphate crystal), the surgeon creates 0.2 millimeter openings in the footplate of the stapes. 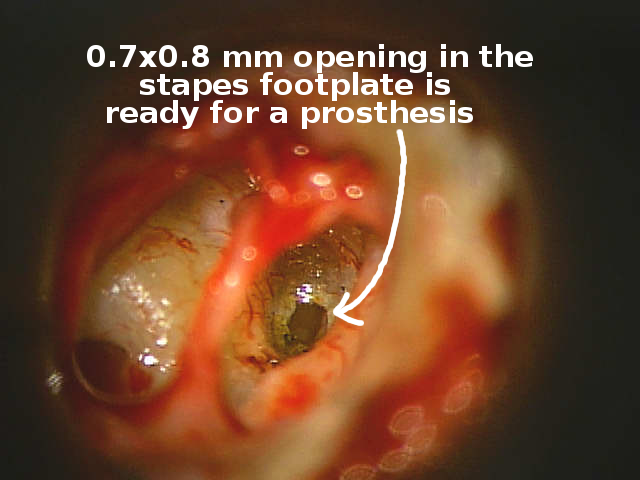 The rosette pattern of the laser “hits” allows the center approximately 0.6 to 0.8 mm opening to be accessed for subtotal removal of the stapes footplate. The prosthesis preferred at the Tampa Bay Hearing and Balance Center is a cup shaped prosthesis. The cup attaches to the incus while the stem sits on the soft tissue seal of the inner ear. Opened footplate of the stapes into the inner ear. This open hole is sealed with fascia taken from a small muscle behind the outer ear. 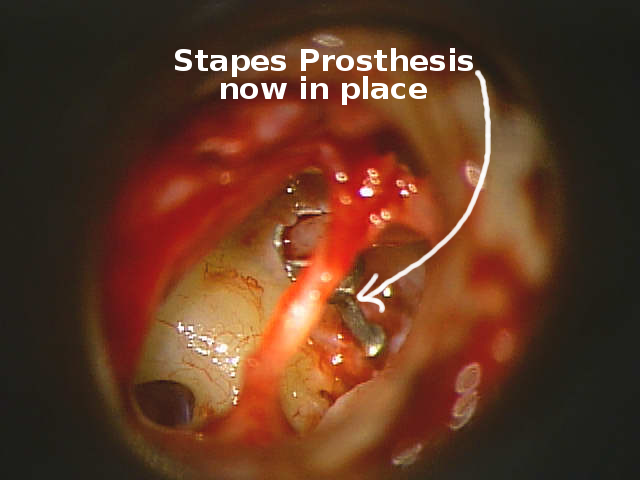 The Stapes prosthesis has been positioned and engaged to the incus. Note the bailing wire that locks the prosthesis onto the incus. To the left of the prosthesis, a portion of the soft tissue that seals the inner ear can be seen. Dr. Bartels worked with Grace Medical to patent a new type of stapedectomy prosthesis. The Bartels Titanium Bucket Handle Prosthesis combines desirable features of several stapes prosthesis types. The hearing bones are built to transfer energy through the tip of the second hearing bone (the incus) to the top of the third hearing bone (the stapes). 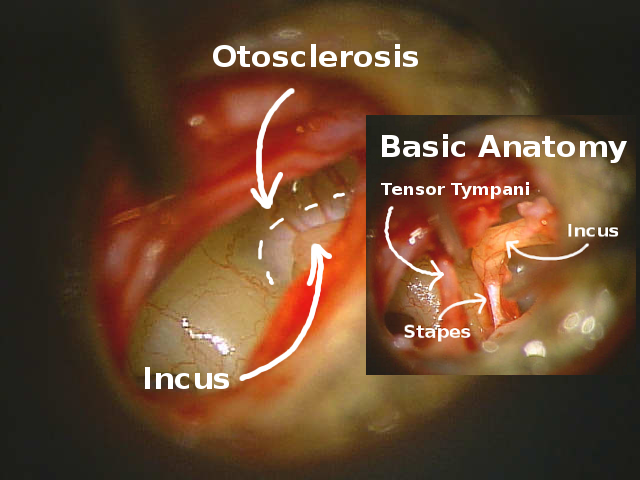 When the stapes bone must be replaced to restore hearing for a disease called otosclerosis, the prosthesis type that transfers energy from the incus tip (lenticular process) to the inner ear is called a “bucket” prosthesis. Prior to the Bartels Titanium Bucket Handle Prosthesis, no prosthesis existed that could adjust to the varying size of the incus tip. The slotted design in the Bartels bucket has malleable tines that can be adjusted to fit almost any size incus. The common challenge in the use of traditional bucket-style stapes prostheses is that the fit to the incus is commonly a bit loose. The Bartels design allows the fit to be adjusted to an accurate fit with the goal of better sound energy transfer. The alternative to stapes bucket is a group of so called crimpable stapes replacement prosthesis, usually shaped like a shepherd’s crook. The shepherd’s crook and other prostheses in this category fit to the longer body of the second hearing bone, the incus, and carry some long term risk that a less than ideal fit may wear the attachment site out. Vibrational energy with a slightly loose prosthesis along the shaft of the incus may very slowly wear through the bone. 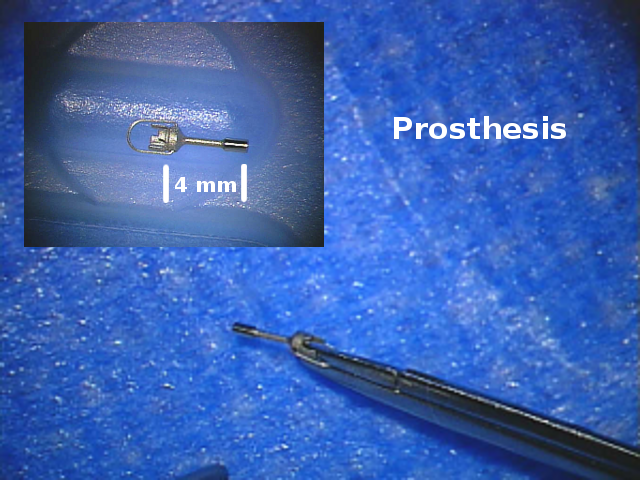 The value of the crimpable prosthesis, though, is its ease of insertion through a smaller opening in the stapes footplate than would be feasible with the bucket type prosthesis. The Bartels Titanium Bucket Handle Prosthesis combines the ability to use a smaller stapes footplate opening with the goal of a lower long term risk that the prosthesis would wear through the incus. Alternative stapes prosthesis types can be found on the following web site resources. A number of these prostheses are quite useful. Dr. Bartels believes that the titanium slotted bucket design with a piston tip will provide a uniquely special and broadly applicable prosthesis for stapes surgery. Most patients typically go home within two to four hours after surgery. A dressing placed at surgery should not be removed until two days after surgery. A family member may remove the head dressing. Remove the ear opening cotton and any wick present – leave nothing in the ear, but do not clean the ear with a Q-tip. Keep water out of the ear – use a Vaseline – petroleum jelly – soaked cotton ball to plug the ear for bathing. Do not put the ear – head under water until the doctor says the ear is ready. Usually an incision behind the ear can be washed starting two days after surgery. Pat it dry and coat it with Polysporin, Bacitracin, Neosporin or similar antibiotic ointment after bathing (remember to keep water out of the ear with Vaseline soaked cotton, though.) If the incision becomes red, call the doctor. No lifting, pushing, bending, stooping, or use of an easy chair for two weeks after surgery. From two to six weeks after surgery, do not lift anything heavier than a gallon of milk. No strenuous exercising, and no activities that require straining for the first six weeks after surgery. Plan to see the doctor about two weeks after surgery. Plan to return to work after a week if work does not require any heavy lifting or straining. If heavy lifting is necessary at work, stay out of work for at least six weeks. At that time ask the doctor when to return to work. In order to prevent placing any strain on the surgical site, avoid blowing the nose vigorously. Open your mouth and do not pinch the nose for sneezing or coughing. If constipated, obtain a laxative instead of straining to have a bowel movement. The ear usually hears better immediately after surgery, but temporarily declines as the middle ear fills with fluid. Some pulsation, popping, clicking and other sounds may occur in the ear. Ear fullness and occasional sharp pain may appear. All of this will go away gradually after surgery. Use pain medication only as needed: Tylenol or equivalent for less serious pain and stronger pain medicine as prescribed. If the pain medicine fails to relieve pain, notify the doctor. At two to eight weeks after surgery, the middle ear fluid reaction to surgery gradually clears. The hearing may fluctuate as the ear crackles and pops open. Expect loud noise to be annoying for up to six weeks. Sometimes, taste disturbance occurs, but usually clears within a few weeks to a few months. On occasion, it can be permanent. Patients sometimes experience dizziness and nausea after stapedectomy surgery. Some mild unsteadiness and brief dizziness with head turning is not uncommon. If dizziness is marked, do not get up without assistance. If dizziness is present, carefully increase walking every day. Notify the doctor if your dizziness is either marked or worsens. If dizzy, do not drive until quick head turns can be made without disturbing ability to focus. At the time of the post-op visit, ask the doctor when to resume driving.